Information Commissioner’s Office, Gujarat State has released recruitment notification for Senior Sub Auditor & Information Assistant posts vacancies. Candidates are advised to check the notification for details. 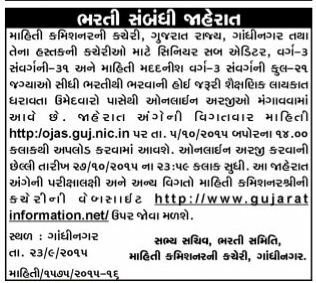 Eligible candidates can apply online form from the official site ojas.guj.nic.in, www.gujaratinformation.net or direct link provided below. More details about Gujarat Information Senior Sub Auditor and Information Assistant bharti like age limit, how to apply are givin below.